Best WordPress Themes for digital agency, creative studios, portfolio, blog and corporate Websites 2016. The themes are fully responsive and comes with amazing demos, multiple header styles, shop layouts and number of CMS pages. These new WordPress Themes are truly solution to build powerful and professional business website or eCommerce store. Fashion Plus is a dedicated WordPress theme for Fashion based on the best eCommerce WordPress platform – WooCommerce with all pages and features supported. The theme comes with amazing 3 demos, multiple header styles, multiple shop layouts and number of CMS pages. Brooks is a Perfect Multi-Purpose WordPress Theme for Digital Agencies, Creative Studios, Real Estate websites, Blogging, Portfolio, Shop, etc. Brooks is a fresh look at design, thousands hours of work on code, usability and functionality. You can easy create your perfect site with user friendly theme settings, good organized layout designs and ‘Drag and Drop’ content builder. 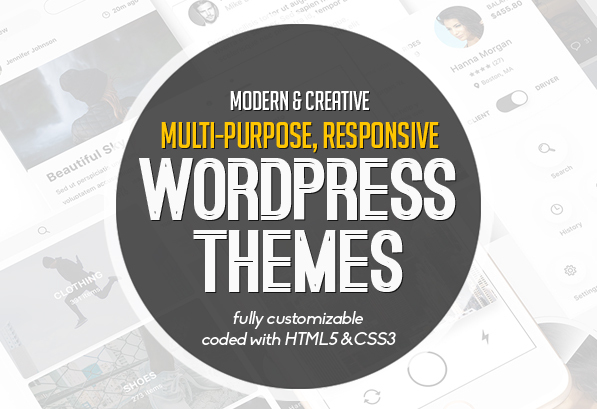 Click is a powerfull and flexible multiconcept WordPress Theme. Can be successfully used for corporate site, blog site, ecommerce site, portfolio and many more. It’s created by using the latest HTML5 and CSS3 techniques in accordance with the latest WordPress Coding Standards. Fits all popular mobile devices and tablets. Zaria – A beautiful, smart and customer-oriented design idea for your website layout. Your customers will have chance to experience your website in a delightful and convenient way. Martin – Multipurpose Responsive WordPress Theme. Simple to setup and very simple and straight forward which is the best way to express you and your business. Personal, Blog, Agency, Business, corporate whatever your sector is, with Martin, you can build your site as potential tool with wide range of features portfolio, gallery, blog and the most convenient way to communicate with you. FinanceBank is a financial WordPress theme for financial advisors, accountants, planners, consulting firms and banks. The theme has clean and fully responsive design. It is extremely flexible and includes drag&drop page builder that allows you to create unlimited layouts with unlimited color settings. Liftsupply is a creative & powerful multipurpose WordPress theme for One Product or One line product based on WooCommerce. The theme incredible design concepts represents your product features in the smartest ways. The 360 Product View transforms your passive product display into an interactive engaging shopping display to view your product in 360°. Consult Plus, a customized and responsive standard WordPress Theme for professionals and freelancers who are looking for a website which can be used for a Corporate, Agency, Creative, Personal, and small or large business websites. Packed with sundry features and breathtaking functionality, Consult Plus WordPress Theme is an ideal choice to build the corporate websites easily. Magazy is a Responsive Magazine WordPress Theme with Visual Composer. For writing content you can use default WordPress editor or you can use Visual Composer that is uncluded in theme. WordPress Theme Magazy is a Responsive Magazine WordPress Theme with many features: easy to use Layout Builder (Visual Composer), on-click Theme Options, Responsive design, unlimited layouts, unlimited colors, different post layouts, many useful short codes integrated into the Visual Composer and much more. Oslo, the brand new WordPress Theme from VERTIQAL TEAM. Combining bright colors with a clean design, Oslo is perfect to make your business pop out. This theme is also suited for a creative agency, a cutting-edge business or a breakthrough field. All the files are well organized and easy to customize. Enjoy it’s sleek curves now in the WordPress version. CheerUp is a theme with luxury design options, tailored to be exceptional on all kinds of blogs. Not only the built-in modern design choices are aesthetically pleasing, it’s packed with over 100 possible layout combinations. A WordPress Business/Multipurpose/eCommerce theme designed for multipurpose company. H2shop is an advanced WooCommerce WordPress theme that is suitable for any eCommerce websites: fashion, jewelry, watches, accessories, etc. The theme has extremely features, easy to use and fully responsive, it will look great on all types of screens and devices. An elegant, powerful, and incredibly versatile WordPress theme to set up a website? Meet theShop, a stunning, fully customizable, Retina-ready web solution designed to take your online store, blog, or portfolio to the next level. Titanium, a Multipurpose WordPress Theme, is created for many different kinds of businesses and blogs such as Agency, Business, Corporate, Portfolio, Freelancer, Photography, Studio, Presentation, One page, Shop, Blog and any online site you want.